Robert Price was a true friend and inspiration to the students at St. Joseph Catholic School in Marietta. 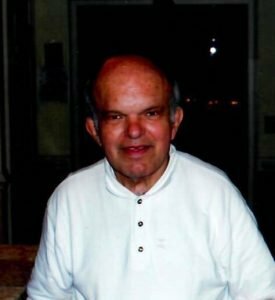 Despite living with a disability, Robert rose above obstacles to become a loyal friend, a faithful member of St. Joseph Catholic Church, and a motivation to all whom he encountered. Robert was proud to be Catholic. He was a member of the Knights of Columbus and could frequently be seen walking in the community, praying the Rosary. After Robert passed away on February 5, 2014, the school wanted to celebrate his life. 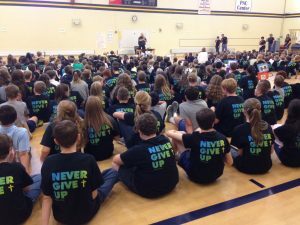 The eighth grade class of 2015 selected Robert’s motto of “Never Give Up” to adorn the annual Spirit Shirts worn by the entire student body for select events. They also dedicated the school gym to Robert Price with a hand-painted mural as their graduation gift. To continue to build off the passion of the students, Paul and Renee Armstrong, parishioners of St. Joseph Catholic Church and parents of alumni of the school, established The Robert Price “Never Give Up” Scholarship Fund in his memory. The fund will provide scholarships for middle school students at St. Joseph Catholic School with a heart for service. Scholarship recipients and their families will have the opportunity to serve an organization of their choice and grow in servant leadership. To give to the “Never Give Up” Scholarship Fund, please click here. To learn more about being part of the scholarship, please click here.